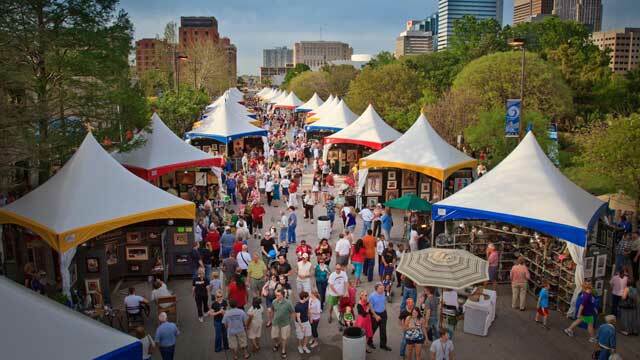 Since 1967, the Festival of the Arts has been Oklahoma City’s rite of spring. The Festival is a community celebration of the visual arts, performing arts and culinary arts. The 2015 Festival of the Arts will take place April 21-26 in Downtown Oklahoma City at the Festival Plaza and the Myriad Botanical Gardens. The festival runs 11 a.m. to 9 p.m. Tuesday through Saturday and 11 a.m. to 6 p.m. Sunday. Admission is free. Pets are not allowed. A variety of children’s activities are featured in the Youth Plaza and around Festival grounds. Arts for children and families include hands-on activities in the Children’s Art Field for just $2. The Young-at-Art Mart is the children-only shopping venue with all artwork affordably priced for $5 or less. Families can also visit Face Painting, Pottery Place and Creation Station for more fun! For more information call (405) 270-4848. More than 500 artists applied and submitted work for the Festival jury process. The 144 chosen artists are some of the nation’s finest. Media includes oils, water, drawing and printmaking, photography, ceramics, glass, sculpture, fiber, jewelry, wood, and two and three-dimensional works. From appetizers to desserts, the Festival is a celebration of the culinary arts! Thirty-one vendors bring their specialties to the International Food Row and throughout the grounds. Each food vendor is partnered with a local arts organization, so each bite you take supports the arts in central Oklahoma! Nearly 300 entertainers of all ages donate their performances on four stages at the Festival. Stages are: The Cafe Stage (located on the Festival Plaza), the Art Moves Stage (located in the Myriad Gardens), the Water Stage (located in the Myriad Gardens) and the Great Lawn Stage (north of the Crystal Bridge in the Myriad Gardens).